The night I met Beck, I was spinning records at a house party in Northeast. Beck and her friend decided to stop by on their way to another party. I instantly noticed Beck walk in. Beck is totally my type: the androgynous/edgy/ but-not-too-edgy-with-tattoos type. After I put on the next song, I walked over and introduced myself. Beck asked me if I was the DJ, and I replied “ Yeah, I also DJ ‘lesbian’ parties.” (This was my way of dropping an obvious clue that I am into girls.) Beck replied, “That’s cool. I am also a DJ,” but I found out later that she was really thinking about how hot I am! I know it’s cheesy, but it really felt like love at first sight. The universe had lined us up that night for a reason. From that night on, Beck and I have been together. 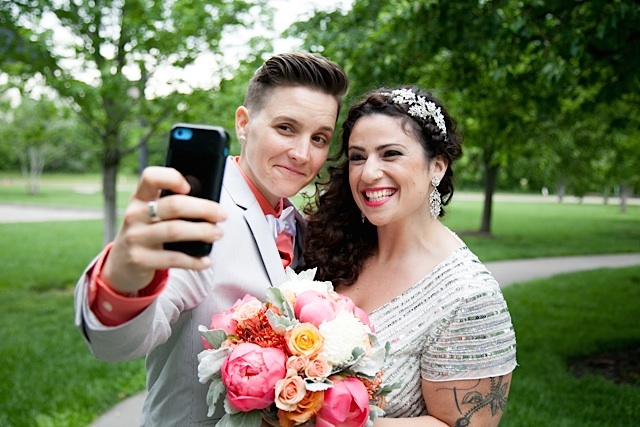 Beck proposed to me about a year-and-a-half later, and our big gay Jewish wedding was on June 1, 2014. I am a professional event planner; so planning my own wedding was like my dream come true. I love my career and the opportunity to be creative on a daily basis. I got into event planning after finishing my Master’s degree in Social Work. I thought I was going to be a case manager, but found an amazing job planning fundraising events, instead. I started planning a year out. I first secured the venue, the caterer, the photographer, and asked my business partner, Tawnya “ Sweetpea” Konobeck to help me plan. The next step was asking our friends and family to be part of the wedding and assigning them tasks. Designing the look of the wedding was simple. I decided to rent colorful linens to give the reception a beautiful coral “pop” with charcoal and mint accents. I handmade the centerpieces from thrift store vinyl and spray painted Bundt pans. Throw in some succulents, paper lanterns, and some glitter-and voila! Perfection. Beck and I both agree that the most memorable part of the event was dancing the hora. In the Jewish tradition, everyone at the party danced in a circle and the couple gets lifted in chairs. Beck and I were hoisted up into the air and circled by a community that supported us. The feeling of actually being lifted by the people that love us the most made our commitment to each other elevate to a new level. The best advice I would give any couple is to plan ahead. I was able to save hundreds of dollars by ordering my invitations and decorations on Black Friday, and at thrift stores. Another piece of advice is to not be afraid to negotiate with vendors for what you want. Most vendors are willing to drop the price a little, just by asking. Finally, HIRE AN EVENT PLANNER! It’s the best money you can spend, to not have to worry the day-of your wedding.